Last weekend I popped down to the Sentry Box with a couple friends. 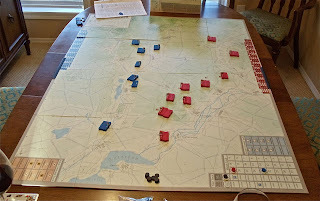 Besides a book, some paint and some terrain, I picked up a couple games: Napoleon's Triumph by Simmons Games and Prussia's Defiant Stand by Worthington Games. 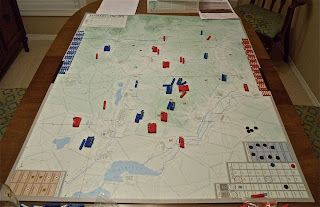 Last night we played Napoleon's Triumph. This game is about the Battle of Austerlitz set on Dec. 2, 1805 between the French and the Austrians and Russians. There are 2 scenarios: one is a hypothetical scenario which starts the battle on Dec. 1 and the other is the historical scenario which starts the battle on Dec. 2. 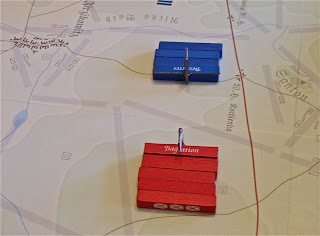 We played the historical scenario. Here's the game at setup with the French on the left and the Allies on the right. The French left flank had been smashed with the bulk of their remaining forces being in the middle. Unfortunately for the Allies, their centre was in the process of overrun when the game ended. The game ended in a French decisive victory due to the sheer number of casualties inflicted. Unlike the real battle, the French had sustained heavy casualties and were not too far from losing themselves. The historical scenario took us about 4 hours to play. The rules themselves are not very long being about 9-10 pages long. That being said the rules are reasonably complex with regards to actual combat. Our post game discussion came to the conclusion that battles are going to be bloody and are not going to be cake-walks. The map is pretty big and the board itself is a really nice looking board. Oh and there's no dice or cards! I look forward to playing this one again. I'm sure I played this with Bruce last year and enjoyed it. I also recall there was some sort of obvious opening move to contain one side in its initial deployment but my memory is vague. Maybe you're thinking of Bonaparte at Marengo, which this is the sequel to.